Here’s something you should know about me. I don’t really like carrots. Not raw ones anyway. Here’s something else I should tell you. I despise ginger. Especially fresh ginger. One more thing. I love carrot-ginger dressing. Seriously love it. Always have. I first tasted this dressing, like many people did, at a local Japanese restaurant. I’m pretty sure the house salad came with the entree. Oddly enough, I remember nothing about the meal but the “free” salad. Maybe that’s because my mother is an amazing cook, and has an even better palate. She has this magical way of tasting something at a restaurant, closing her eyes and tasting all of the components, then going home and recreating it. My mother made this dressing all the time when I was a kid. And recently I saw this at another table in a restaurant (admit it. You totally check out what everyone else is eating, right?) and thought about how I should seriously make it myself. Sadly, my mother doesn’t believe in exact recipes, so I turned to the handy dandy Internet. This dressing came out absolutely perfect. It was everything I remembered, and more. If there’s a better way to eat lettuce, I haven’t encountered it. One more thing- white miso paste isn’t exactly a pantry staple, but seriously, it’s completely worth purchasing it for this dressing. Seriously. Place carrot, ginger and shallot in food processor and process until finely chopped.Scrape down the sides and add the rice vinegar, miso paste and sesame oil and process. With the food processor running, slowly drizzle in the oil and water. Serve over lettuce and vegetables of your choice. Do you recall what restaurant you had the dressing at? 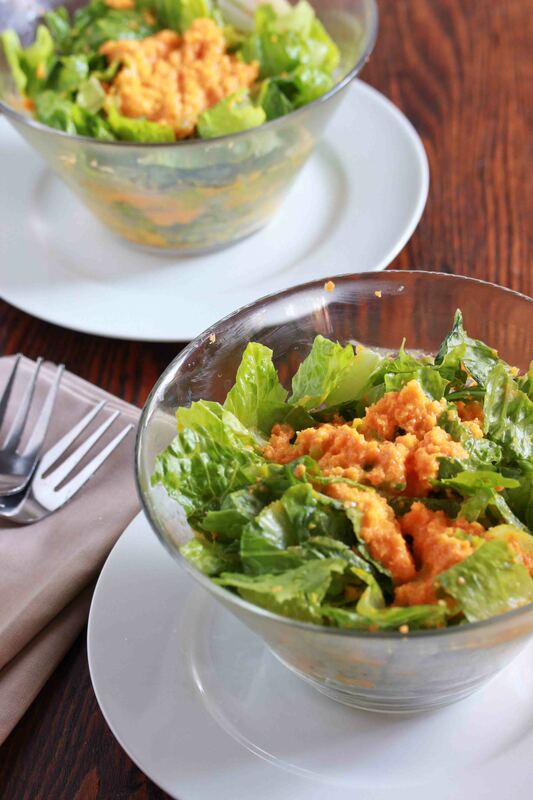 My family loved to go to the restaurant Haikara Grill in NYC and among all of their amazing food, was the ‘free’ salad with the carrot ginger dressing that I was never able to duplicate at home. They made an awesomely delicious negamaki with teriyaki sauce (thinly sliced beef rolled around scallions and grilled.) I am usually able to duplicate restaurant recipes at home but I have not figured out what cut of kosher beef is used for that recipe. I’ve tried many types and its never right. I will definitely try the dressing recipe. I like the idea of using carrots in a dressing. I’m also obsessed with this salad dressing. I recently tried to replicate it at home and all the recipes i saw called for miso also. I didnt have time to get any and i was so desperate to make the dressing that i ended up changing things a bit using a ton of different recipes, but one thing that i had put in it was some tahini paste. It gave it great flavor. The recipe was ALMOST spot on, but after i made it i had no clue what amounts i put in so i havent attempted yet to make it again. I think i’m just going to buy the miso paste and make your recipe. It has amounts 🙂 and looks easy enough! Can’t wait to try it!!! Thanks! Also, how long does this recipe last in the fridge? 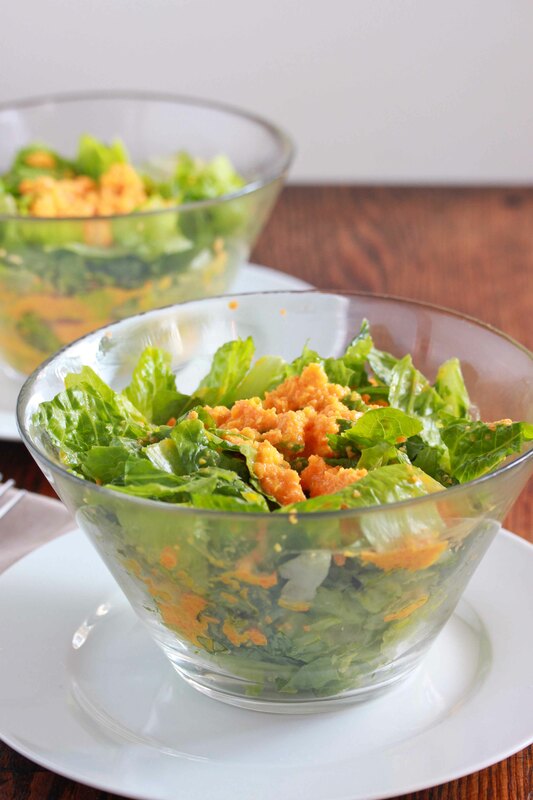 Carrot ginger dressing is one of my favorites. Thanks for sharing this recipe! carrots and ginger are a natural! Nice in a salad, gives plain old lettuce some life. Never tried carrot ginger dressing…but now I will! I prefer raw carrots to cooked carrots! This salad looks and the dressing sounds delicious. mmmm!! his looks and sounds fab! I made this a few months ago and I love it, you remind me I have to make it again. I love carrot ginger dressing! (and I also remember the Haikara salad fondly). very nice, this dressing sounds delicious and gives a lot of texture to lettuce. This sounds yummy. Where can I get white miso paste? Omg! I love this dressing when I go out for sushi! Where can I buy white miso paste? I don’t remember the brand, maybe Eden? I got it at supreme health. I absolutely love this asian inspired dressing! Need to try this version, thanks! Will crushed, frozen ginger cubes work? Should I still use 3 T?